The Compact Muon Solenoid. This particle detector in Switzerland recently discovered the Higgs Boson and continues to search for new particles. UA faculty Conor Henderson and Paolo Rumerio are part of the collaboration using this detector. Experimental particle physics at The University of Alabama consists of collider physics research with the CMS experiment at CERN, direct dark matter search with the LZ experiment, and a diverse group of neutrino projects. A wide range of neutrino properties are being studied by four groups at Alabama. These groups are currently members of several different international collaborations dedicated to studying neutrino. Some of the other physics being looked into by these experiments include: supernovae, neutron decay, neutrino magnetic moments, geo-neutrinos, negative muon capture, and more. 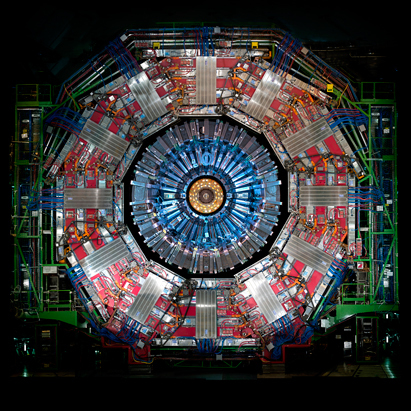 Research activities in the Collider Physics group at The University of Alabama are focused on the Compact Muon Solenoid (CMS) experiment at the Large Hadron Collider (LHC) in CERN, the European particle physics laboratory in Geneva, Switzerland. The UA Collider Physics group is led by Dr. Conor Henderson and Dr. Paolo Rumerio. The CMS Collaboration is an international collaboration of over 2000 scientists who operate the Compact Muon Solenoid detector at the Large Hadron Collider in CERN. The LHC is colliding protons at the highest energies ever achieved in the laboratory. These collisions have already discovered the long-elusive Higgs boson, and it is hoped that they may also reveal even more exotic new physics, such as supersymmetry or extra dimensions of space. For more information on the Alabama group’s activities on CMS, visit the UA Collider Physics group webpage. Neutrino detector in New Mexico, USA designed to detect a rare type of radioactive decay that can determine if the neutrino is its own antiparticle. UA faculties Andreas Piepke and Igor Ostrovskiy are part of this collaboration, called the Enriched Xenon Observatory (EXO-200). KamLAND is a 1000 ton liquid scintillation detector in the Kamioka mine in Japan. KamLAND has been observing anti-neutrinos from the nuclear reactors in the Asian region and played an important role in understanding the phenomenon of neutrino flavor oscillations. By knowing the power of each of the nuclear reactors in the region, the total flux of anti-neutrinos can be deduced. From this total flux KamLAND looks for a deficit in the number of electron anti-neutrinos that it sees. 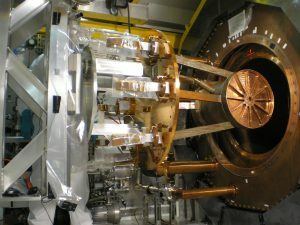 The KamLAND collaboration also developed techniques to purify the liquid scintillator from radio-isotopes to make it possible to see the Be-7 solar neutrino. The purification techniques were developed extensively at Alabama, CalTech, and Tohoku University. Ask Dr. Piepke to learn more about the KamLAND experiment. MiniBooNE is a 800 ton liquid scintillation detector at Fermilab, situated down-line from the 8 GeV proton accelerator. There it converts protons into pions by colliding the protons into a beryllium target. The pions are unstable and decay into muon and muon neutrino pairs. The muons interact well with matter and can easily be stopped by a steel absorber. The neutrinos, however, have a very small cross section which allows nearly all of them to pass unhindered through the steel and into the detector. Here MiniBooNE looks to observe the appearance of electron type neutrinos which oscillated from the muon neutrino. MiniBooNE has a unique capability of observing both muon neutrinos and muon anti-neutrinos by focusing the positive and negative pions produced in the collision with the target by a large magnetic field. By changing the magnetic field they are able to focus the negative pions, which decay into negative muons and muon anti-neutrinos, toward the detector. MiniBooNE is looking to uncover the existence of a hypothetical fourth non-interacting sterile neutrino, existence of which was suggested by the LSND measurement. 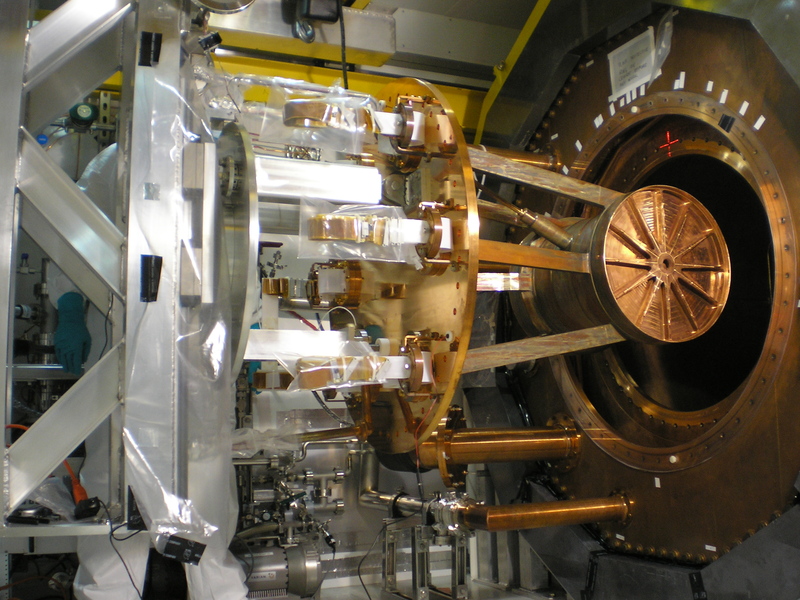 EXO-200 uses enriched liquid Xenon to search for the neutrinoless double beta decay. Existence of this decay will prove that neutrinos are their own anti-particles, which would make them the only known Majorana fermion. EXO-200 has discovered the two-neutrino mode of the double beta decay in Xe-136 and established stringent limits on the neutrinoless mode. Its last search for the neutrinoless double beta decay was published in Nature. We played important role in preparation of the experiment and made leading contributions to the data analysis. While EXO-200 will continue taking data for several more years, we are already working on the next generation experiment, nEXO. nEXO will contain 5 tonne of enriched xenon. It will be located 2 miles underground, in the SNOLAB facility in Canada. Ask Dr. Piepke and Dr. Ostrovskiy about the double beta decay program at the UA. Double Chooz is a neutrino oscillation experiment designed to measure the last unknown neutrino mixing angle ϑ13. It used the site that is home to the former CHOOZ experiment in France. The measurement process involves the correlation of events from a near and far liquid scintillation detectors. This allows one to study neutrino oscillations with a much smaller systematic error, as compared to a single detector. Double Chooz published its first result in 2012, suggesting a non-zero value of the ϑ13. The UA group played the key role in this result, from the calibration, to determination of major systematic uncertainties, to the final statistical analysis. The paper received more than 1000 citations to date. Ask Dr. Stancu, Dr. Busenitz, and Dr. Ostrovskiy about the neutrino oscillation program at the UA. ν – SNS will be situated at Oak Ridge National Laboratories at the Spallation Neutron Source (SNS) which is currently under construction. Once construction on the SNS is complete a neutrino detector will be placed here designed specifically to measure the neutrino-nucleus cross sections of importance to current neutrino physics and cosmology. The project will be complete in approximately three years after SNS is is completed and it is proposed that the first neutrino-nucleus cross section can be measured to within an accuracy of 10% within the first year of operation. Ask Dr. Stancu for more details. The group headed by Dr. Jerry Busenitz currently focuses on the LZ experiment. It also played a significant role in analyzing the calibration data for the KamLAND detector and the design and certification of its calibration sources. The group consists of a Post-Doctoral Researcher and two Graduate Research Assistants. Dr. Busenitz was also involved in the development of Double Chooz experiment. This work consisted of performing low-background counting of material samples and Monte Carlo simulation of detector designs. The group headed by Dr. Ion Stancu is working on the LZ and MiniBooNE experiments. It consists of one Post-Doctoral Researcher who is working on site at FermiLab and two Graduate Research Assistants. Dr. Stancu is also working on the Double Chooz and ν – SNS experiments. Dr. Piepke’s group also has the capabilities of performing ultra sensitive measurements of radio-isotopes by using neutron activation analysis. This is a method in which neutrons are used to excite the material’s isotopes, which then subsequently decay, and the parent nuclei are detected in a low background germanium detector. By knowing the flux of neutrons from the reactor a measurement of radio-isotopic abundance is calculated. This capability is used to screen materials for use in KamLAND and EXO. Other detection capabilities consist of a second germanium detector for counting high activity samples, an alpha detector and a 212Bi – 212Po coincidence setup. Dr. Ostrovskiy has recently joined the Experimental Particle Physics group. He works on searches for the neutrinoless double beta decay and other exotic physics in the EXO-200 data, and also on the R&D for the nEXO experiment. Dr. Ostrovskiy is also interested in the magnetic monopoles. He participates in the MoEDAL experiment, which searches for the monopoles at the LHC.